BROOKLYN, N.Y. -- Randall Bailey was way behind Mike Jones in their welterweight title bout in June, but Bailey has the great equalizer in boxing: sick one-punch power. He used it against Jones, knocking him down in the 10th round with one right hand, then knocked him out with another crushing right in the 11th round to win the belt. But Bailey had no such luck against Devon Alexander on Saturday night, losing a lopsided decision and his title at the Barclays Center in the first of four world title bouts at the new $1 billion arena that brought world championship boxing back to Brooklyn for the first time since 1931. It was one of the undercard fights on the show headlined by the rematch between junior welterweight titlist Danny Garcia and former titleholder Erik Morales. 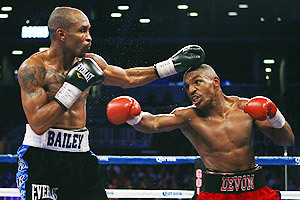 Al Bello/Getty Images/Golden Boy Promotions Randall Bailey rarely let his hands go Saturday in Brooklyn, N.Y., and consequently lost his welterweight title to Devon Alexander. Alexander easily outboxed Bailey and stayed away from his powerful right hand to win 117-109, 116-110 and 115-111, in a fight that provided very little action and had the crowd booing early and often. ESPN.com had Alexander winning 117-109. "I know I could do way better," said Alexander, listening to the crowd boo but happy to become a two-division titleholder. "Randall is a veteran, and everyone knows his right hand. I coulda did way better. I had to be cautious." Alexander was cautious and Bailey was practically in a coma, doing almost nothing other than coming close to touching Alexander a few times with the right hand. While Alexander (24-1, 13 KOs) landed 120 of 534 punches (22 percent), according to CompuBox statistics, Bailey landed just 45 of 198 punches (23 percent). The 45 punches are the fewest ever landed in a 12-round fight in any division in CompuBox's 27-year history, during which it has tracked thousands of fights. "He was young and he was fast. He moved a lot," said Bailey, 38, of Miami. "He moved a lot faster than I thought. I couldn't get him to stand in front of me. I couldn't get set and fight my fight. He had the youth." Said Alexander, of St. Louis: "I expect my work rate to be high. I knew I would come here and be smart and he'd throw that bomb, the right hand. I had to be smart. I will continue to learn. I'm champion again, three belts at 25 years old." The fight was sloppy, with a lot of holding and grabbing. In the sixth round, referee Arthur Mercante was a bit tired of seeing Alexander and Bailey hang on each other and deducted a point from both at the same time, so it had no impact on the scoring. The fight originally had been scheduled for Sept. 8, but Bailey (43-8, 37 KOs) injured his back in sparring and the fight was postponed six weeks. At least with the rescheduling, the bout could be hidden on an undercard. The few rights that Bailey landed, Alexander took well. "I expected him to be strong," said Alexander, in his second fight at welterweight. "That's what we trained for. He's got more knockouts than I got wins, but I got a chin." Bailey, also a former junior welterweight titlist, broke down and cried after the fight, saying he was unsure what he would do next. "I'm gonna go home and think about it, but my heart tells me I still want to fight," he said. Earlier on Saturday in England, Kell Brook knocked out Hector Saldivia of Argentina to become the mandatory challenger for Alexander. Brooklyn middleweight Daniel Jacobs (23-1, 20 KOs), the 2009 ESPN.com prospect of the year, stood on the ring ropes after destroying Josh Luteran (13-2, 9 KOs) in the first round and shouted "I'm back! I'm back!" He sure was, after fighting for the first time in 19 months following a battle with cancer in his back, which left him paralyzed for a time and near death. Alex Trautwig/Getty Images Former ESPN.com prospect of the year Danny Jacobs, fighting for the first time since recovering from cancer surgery, knocked out Josh Luteran in the first round. "No moment has ever been greater than right now," Jacobs said. "This moment means the world to me. They told me I would never walk or box again, and I proved everyone wrong. I gave a great show and I want everyone in Brooklyn to be proud." Jacobs didn't have much in front of him in Luteran and he went right through the club fighter with ease, ending the bout in dynamic fashion. Jacobs was landing his right hand before crashing a left hook to his chin, followed by a right to the forehead that knocked Luteran out cold. He went down hard as his leg bent back and he hit his head on the mat. Referee Eddie Cotton immediately called it off at 1 minute, 13 seconds. "I feel a little sad the way I hurt him, but I wanted to make a statement," Jacobs said. "A first-round knockout in Brooklyn in a brand-new arena. This is electrifying." • Former welterweight titlist Luis Collazo (32-5, 16 KOs), who was born in Brooklyn and lives in Queens, shook off a year-long layoff to outpoint Philadelphia's Steve Upsher (24-2-1, 6 KOs) in a toe-to-toe fight. Collazo, who held a welterweight belt in 2005 and 2006 before losing via controversial decision to Ricky Hatton, hadn't fought since an upset decision loss to Freddy Hernandez last October in a fight in which he was knocked down by a body shot. Despite the layoff, Collazo looked sharp as he and Upsher battled hard for the entire fight, which Collazo won on scores of 80-72 (a surprisingly wide margin), 79-73 and 77-75. • In a slow-paced fight, Ukrainian-born Brooklyn welterweight Dmitriy Salita (35-1-1, 18 KOs) easily outboxed Brandon Hoskins (16-31, 8 KOs) for a six-round decision victory. Salita won 60-54, 59-55 and 59-55. He fought for a junior welterweight world title as a mandatory challenger in 2009 and was knocked out in the first round by Amir Khan in England. • Bronx junior middleweight prospect Eddie Gomez (11-0, 8 KOs) needed just 1 minute, 23 seconds to blow out Saul Benitez (2-3, 0 KOs) of Phoenix. Gomez, 20, knocked Benitez cold with a left hook in the first round. • The first fight in Barclays Center history ended in a six-round draw between Brooklyn junior middleweights Boyd Melson (9-1-1, 3 KOs) and Jason Thompson (5-6-2, 4 KOs). All three judges scored the scrap 57-57. In the opening round, Thompson dropped Melson hard with a right hand. But Melson, an alternate on the 2008 U.S. Olympic team, dropped Thompson in the third round with a left hook in a fight that was deserving of a draw.